Great picture Jeff! Looking tough. Looking good! I hope you both had fun. Did you run it together? Yes, we ran together. It was a small race (50 runners?) and I had nothing to prove by being the, "see ya!" boyfriend so we ran it shoulder to shoulder at a pace that let us talk. The winner in my category was only a little ways in front of us the whole time so, ya, fun time. The shoes are the Scarpa Spark GTX I reviewed in June 2013. They are now my pavement shoes since the tread is all gone. Cool. 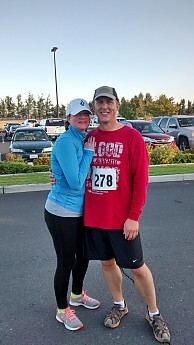 You both look happy after the race too. I ran with mine on my first 5K a few weeks ago. I'm certain it made me go faster.